Opa-Locka City Hall is located at 3400 135th Street, NW, Opa-Locka, FL 33054; phone: 305-953-2868. Photo: Long House, Opa-Locka, Miami-Dade County, Fl. Listed on the National Register of Historic Places in 2009. Photographed by User:Ebyabe (own work), 2010, [cc-by-3.0 (creativecommons.org/licenses/by/3.0)], via Wikimedia Commons, accessed December, 2013. Opa-locka was incorporated in 1926. The area was originally named by the Native Americans "Opa-tisha-wocka-locka" meaning "a big island covered with many trees and swamps" but the name was quickly shortened to Opa-locka. "One thousand and one reasons," began an advertisement in a January, 1926, issue of the Miami Herald, could be given to encourage investors to "get in on the ground floor of a never to be repeated opportunity" - an opportunity to participate in the realization of a dream, a dream of the Arabian Knights. The dream was Opa-locka, a city designed to meet all of the needs of its residents, a city of beauty, a city of convenience, or as it was proudly advertised, the "City Substantial." Its visionary was Glenn Hammond Curtiss. Opa-locka is a product of Florida's mid-1920s Land Boom. The Boom, often noted for its wild fluctuations in real estate prices, produced some of the state's better-planned cities such as Coral Gables, Country Club Estates (Miami Springs) and Hollywood. At its height, developers used a variety of approaches to publicize their suburbs and attract buyers. One such method was the creation of the "thematic" community, that employed an architectural style or theme to unify the city appearance. The use of architectural themes as a promotional tool became a common practice in South Florida during the Boom period. Most notable of these were Glenn Curtiss' two earlier developments: the Spanish Mission-style town of Hialeah and the Pueblo revival community of Country Club Estates. Merrick's Mediterranean style Coral Gables had successfully used a single unifying architectural style to provide an easily recognizable image. 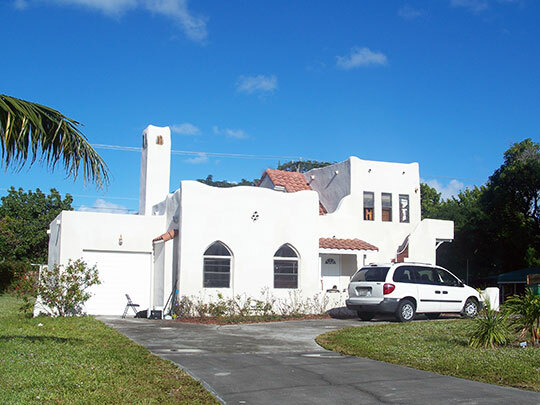 Opa-locka set itself apart from the rest of South Florida's other developments in 1926 through its use of Moorish Revival architecture and its incorporation (in plan) of Ebenezer Howard's Garden City approach to community design. No other community in the nation is known to have exclusively employed this theme and approach. Opa-locka is believed to contain the largest single concentration of Moorish Revival buildings in the United States. Sixty-five structures presently remain out of an estimated one hundred originally constructed between 1925 and 1927. Florida's speculative real estate ventures from 1920-1926 produced a frenzy of new construction, subdivisions and communities in what was once farm, land or everglades. The Boom, primarily concentrated in South Florida, reached its pinnacle in Miami. Promotional brochures described the area as "an idyllic tropical setting with the potential for huge profits." Initially, wealthy winter tourists were enticed to make speculative land investments in Miami, a city that in the early 1920s was fast becoming one of America's most popular winter resorts. By 1924, the population had swelled with middle to lower middle income people who, by then, made up most of the new arrivals in South Florida. The Opa-locka development offered a variety of housing types to attract the growing middle and upper segments of the Miami metropolis. Unlike other typical Boom-time suburbs, Opa-locka was based upon Ebenezer Howard's Garden City concept which at that time had received widespread publicity in the United States. Opa-locka epitomized what an American Garden City should be. It was a fully zoned community with distinct zoning for residential areas, shopping, industry and recreation. Each homeowner was given a garden plot on which to raise food. The community was intended to be self-contained and included such amenities as garden plots, an airport, country club, zoo, swimming pool, parks, a golf course, permanent fairgrounds and archery club. Opa-locka had employment opportunities in manufacturing, construction and the service industries. The town, incorporated in May 1926, was also one of Florida's first to have commuter train service to Miami. Although most Boom-time developments espoused grand plans, Opa-locka not only completed its overall town plan but also a significant portion of its public buildings and a sizable number of residential buildings as well. Rolla L. Queen, Historic Sites Specialist, Florida Division of Archives, History and Records Management, , nomination document, 1981, National Park Service, National Register of Historic Places, Washington, D.C.
Michael Maxwell, Michael Zimny, Bureau of Historic Preservation, Florida Division of Historical Resources, Opa-locka Thematic Group, Miami-Dade County, FL, nomination document, 1987, National Park Service, National Register of Historic Places, Washington, D.C.